On Balance Volume (OBV) is a very popular momentum indicator that tracks absolute change in volume to speculate price movement. It’s a mass belief that volume drives price due to aggressive trades from institutional investors. On Balance Volume indicator essentially tracks this smart money flow into the market and signals future price direction. OBV indicator was developed by Joseph Granville and introduced it in his book, “Granville’s New Key to Stock Market Profits”. 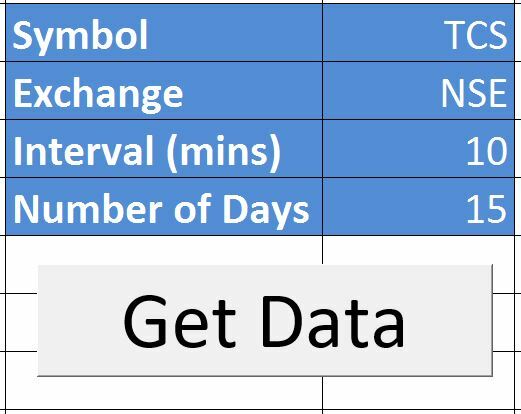 In this post we would understand OBV applications and its calculation steps, there is an real time excel sheet attached at the end of post which calculates OBV for any given stock symbol. 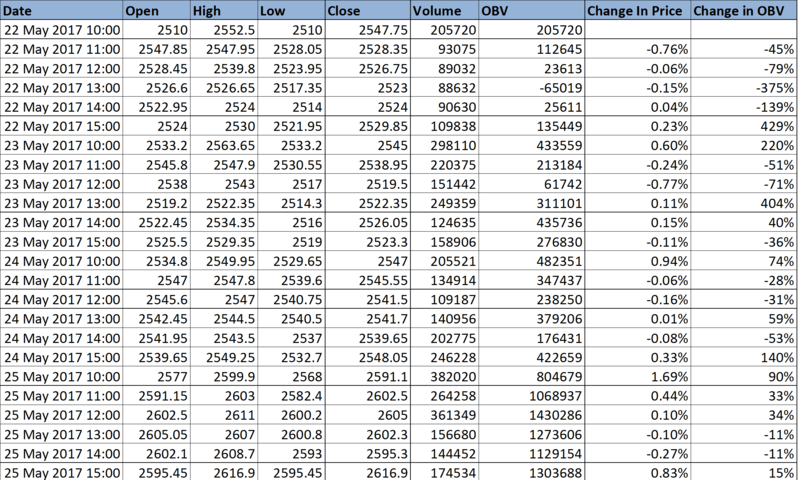 OBV is calculated based on current and previous Close and Volume values. Initial OBV of the price series is equal to absolute volume. As stated earlier OBV tracks smart money flow in the market. Breaking it down further, if absolute volume for a particular period increases or decreases sharply without any significant change in price, then it indicates that the price is going to move shortly. Sharp increase in volume without significant price change signals bullish move, while sharp decrease in volume without significant price change signals bearish move. This theory is backed upon assumption that institutional investors are either buying or selling in bulk when volume changes suddenly. While retail investors are taking positions opposite to institutional investors due to which volume change doesn’t reflect in price movement instantly. Eventually volume would drive the price either upwards or downwards. If change in OBV value is relatively higher than change in price for a given time period, then there may be sharp upside or downside in the price in near future. We have included columns in the Excel sheet which auto calculates change in OBV and change in price. OBV Divergences can be quite handy and reliable too. A Bullish divergence is formed when OBV forms higher high and higher low, while price forms lower low. Similarly Bearish divergence is formed when OBV forms lower high and lower low while price forms higher high. OBV can be very useful for your trading decisions when used with other price action patterns. Step 4: Click on Get Data button. The data would be automatically downloaded and OBV values would be caluclated. This data can be downloaded for max 15 days and the minimum interval is 1 minute. Please see the below link to download OBV excel Sheet. Please let us know if you have any feedback or comments. i have gone thru ur OBC excel sheet and it not working since all macros are disables..
please do the needful .. Appreciated your work and your mind to give it free for others. There is one error while loading data (Eg: Input in order-KIRLOSENG,NSE,15,5), some values are formatted as number which resulted in incorrect value. Using below line before query querytable command will resolve the issue. Hi can i use this for commodity markets? For commodity markets, you would need to enter prices manually in the sheet. There is no automation available as of now. Google finance not returning the stock quotes in standard format. They are returning we page rather than. Could you please help in this regards? Unfortunately we do not have a ETA. We are dependent on Google for this. In the above example if obv is -409% then if it breaks high then buy and if it breaks low then short is that so. I found an alternative way to fetch the real time intra day data using Yahoo API. Just use below URL it is returning data in JSON format. Say, a bullish candle has narrow spread and high volume. It was preceded by a bearish candle with narrow spread body with an above avg. volume. Proceeded by bullish narrow spread, near avg. volume candle. OBV falls sharply..then flattens out. Question: Do you anticipate a future price rise or a fall? Why?